Myology is a scientific study of the structure, arrangement, and action of muscles. 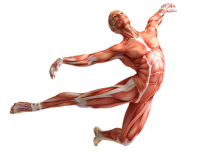 Myology is a study of the muscles, their structure, development, properties and functions. There is a very close interrelation between myology and such anatomic disciplines as surgery, cardiology, angiology, neuroanatomy, and topographical anatomy. Initially, myology was not considered as a separate section of the anatomy. The first research in myology was performed by Hippocrates. Aristotle and Galen were the first who described the kinematic role of muscles. Galen pointed for the first time to existence of the muscles' antagonists causing movement in opposite directions. Medieval scientist Avicenna described for the first time oculomotor muscles. However, the founders of scientific anatomy as a whole and myology in particular were Leonardo da Vinci and Andreas Vesalius, who began with one of the first corpses for research and the description of a structure of a human body. Leonardo da Vinci made a set of detailed anatomic sketches of muscles and their descriptions at various conditions of a body, while Vesalius carried out a systematic statement of descriptive anatomy of muscles in the work "About a Structure of a Human Body". A century later the doctor and anatomist Thomas Villis described for the first time myofibrils and their role in muscular reduction. The surgeon and anatomist Nikolay Pirogov, among other authors with works on topographical anatomy, founded a basis for topography fascia as the auxiliary apparatus of muscular and vascular systems. Peter Lesgaft and his followers developed the direction of a functional myology, studying a role of the environment and physical exercises in organism development, the nature of changes in muscles and bones influenced by physical activities, etc. Physiologist Ivan Setchenov suggested a concept of muscular sensitivity (proprioception).